Normal life in Gaurisagar has been thrown out of gear following incessant rain for the last couple of days. Several areas of this town have been submerged by rain water. Water-logging in most parts of the town is a common sight these days. Rain water has submerged the link road of NH-37, houses and shops. Residents of Gaurisaagar Kumar village, Namdangia Bangali gaon under Jakaichuk mouza of Sivasagar revenue circle are facing tremendous problems due to flash flood. 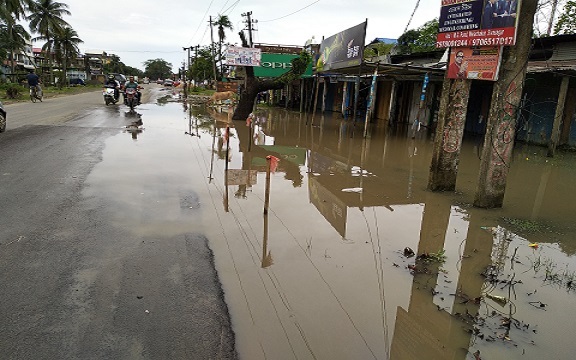 Heavy rains flooded the streets of SBI Gaurisagar entrance road, Namdongia Water Supply Scheme road, Gaurisagar High School entrance and more than 60 houses. School and college students, pedestrians had a harrowing experience while wading through flood waters. Flood water submerged a good number of road side shops on NH-37 under Sivasagar revenue circle. As a result the shop owners had to down their shutters. The residents of Gaurisagar Namdangia Water Supply Scheme road have been demanding the local MLA as well as district administration to construct the road but in vain. Illegal construction on historic Rupahijan has also added woes to the misery of the residents of this town. The residents are of the view that if the historic sewage system Rupahijan is not improved at the earliest, people of Gaurisagar will have to face the problem of water logging for long time. Samor Kalita, a resident of Gaurisagar Water Supply road could not control his tears as he is unable to hold his father’s adya shraddha in his own premises as flood waters submerged his residence.